Report have been circulating regarding Arsenal new manager and the players have been informed that the identity of their new coach is 90% certain. Mikel Arteta is likely to get the job and the Spaniard has also picked his assitant in the person of Santi Cazorla. Report has it that Arsenal are certainly looking for a young coach as they want a long time replacement and not just 3 year appointment. Though there are many big names linked to the Arsenal job but Arsenal are still committed to signing a young coach. Most of the Arsenal board members have all revealed who they want to take over the job. Raul Sanllehi preferred Eurique, who is wage demand is too high for the London. Sven Mislintat prefer Julian Negelsmann but the Hoffenheim coach won't be allowed to leave the club this summer. Ivan Gazidis and Josh Kroenke are now looking to conclude Arteta's appointment very soon though they actually set a deadline of getting a new coach before the World Cup kick off. But appointing Arteta as soon as possible is not a bad idea. 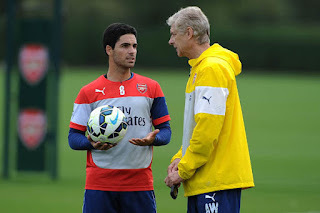 Daily Mail has now reported that the Arsenal players have been informed that Arteta is 90% certain to become their new manager. Arteta's appointment might be a good one for Arsenal but his experience might be a doubt as he has only spent 2 years as an assitant to Pep Guardiola at Manchester City. If he is successful appointed as Arsenal coach, Santi Cazorla will be his assitant and he will be giving a player-coach contact.